mostly in the mountainous region of Kabylie east of Algiers. 1510 - 29 May 1529 Spanish occupation of Peñón de Algiers. 1534 - Oct 1541 Spanish occupation of Peñón de Algiers. 1536 Province of the Ottoman Empire. 1671 Rule of semi-autonomous Deys. 1711 Deys recognized as governors by the Ottomans. Igali 5 Apr 1900; Tuat 1901; and Tindouf 1934). 15 Apr 1845 Named Algeria. two [later six] territories in the South. to 3 Jun 1943], Free French). 1 Nov 1954 - 18 Mar 1962 Algerian War of independence. 1 Jul 1962 by 99.7%). 3 Jul 1962 Recognition of independence of Algeria by France. language upon promulgation of the constitution. 1731 - Nov 1745 Ibrahim III "the Old"
(Ra'is al-Hukumah, Ra'is Majlis al-Wuzara') 27 Sep 1962 - 27 Dec 1978; Prime minister (Wuzara' al-Awaliyy) 8 Mar 1979 - 22 Jan 1984 and from 15 Nov 2008; and Chief of Government (Ra'is al-Hukumah) 22 Jan 1984 - 15 Nov 2008. 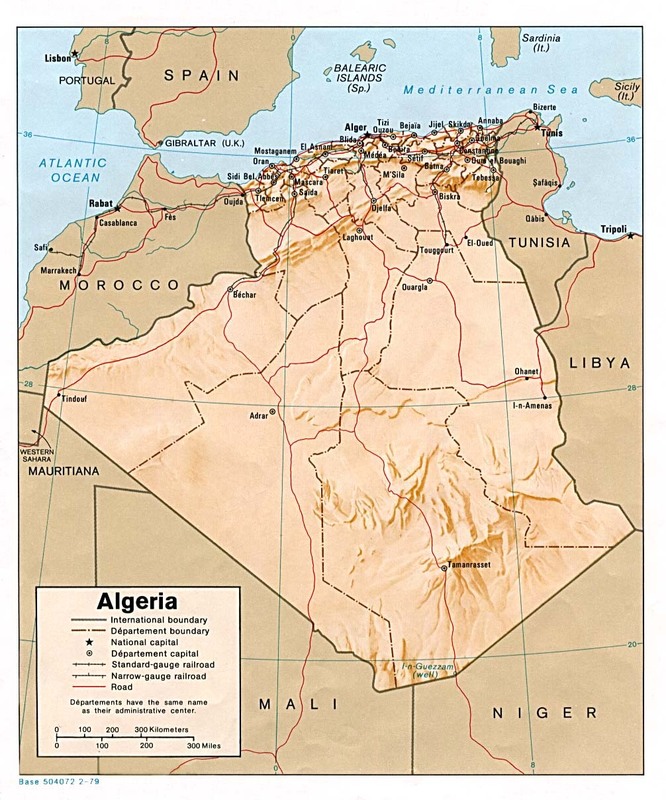 Territorial Disputes: Algeria and many other states reject Moroccan administration of Western Sahara; the Polisario Front, exiled in Algeria, represents the Sahrawi Arab Democratic Republic; Algeria's border with Morocco remains an irritant to bilateral relations, each nation accusing the other of harboring militants and arms smuggling; dormant disputes include Libyan claims of about 32,000 sq km still reflected on its maps of southeastern Algeria and the National Liberation Front's (FLN) assertions of a claim to Chirac Pastures in southeastern Morocco. Oasis), and Touggourt (Territoire de Touggourt). and their effective departmentalization in the near future. Saoura (Aïn Sefra) and Oasis (Ghardaia, Oasis and Touggourt). 5 Jul 1962 Southern Territories part of independent Algeria. military facilities for specified periods. succession to the 10th Military Region. Mers el-Kébir, Colomb-Béchar, Hammaguir, and Reggane). base of Mers el-Kebir on a 15 year lease. directly subordinated to the French Ministry of the Armed Forces. 23 Dec 1970 Bou-Sfer airport is transferred to Algeria. and Reggane) are established in the Algerian Sahara. (Centre d'Expérimentations Militaires des Oasis). using these bases for a period of five years. et des Sites Militaires au Sahara). transferred to Algeria (effective 1 Jul 1967). 1 Oct 1968 Reggane airport is transferred to Algeria. 1535 - 1541 Bone occupied by Spain. 1636 - 1641 Bone occupied by Spain. 1641 Bone a possession of Genoa. 31 Jan 1510 - 1555 Bougie (Bugia) occupied by Spain. 1531 - 1534 Honaine (Oney) harbor near Tlemcen occupied by Spain. 19 May 1509 Oran and Mazalquivir (Mers el-Kebir) Spanish possessions. 21 Jan 1708 Occupied by Algiers, part of the Ottoman Empire. 16 Jul 1732 Spanish rule restored. 27 Fep 1792 Spanish abandon Oran (Mazalquivir abandoned 29 Feb 1792). 6 Mar 1792 Re-incorporated into the Ottoman Empire. 4 Jan 1831 Conquered by France and incorporated into Algeria. 1534 - Oct 1541 Spanish occupation. 1525 Part of Ottoman Empire (Qusantina). 1567 Beylik of Qusantina, subject to Algiers. 1826 Local Kabyle population declares independence. 13 Oct 1837 Conquered by France. 15 Dec 1837 Last bey is deposed by France. 9 Dec 1848 Incorporated into Algeria. c.1750 Kel Ahaggar Tuareg confederation established. 1962 Confederation not recognized by independent Algeria. 1977 Confederation terminated by Algeria. 1414 Sultanate of Tuggurt founded in southern Algeria. 2 Dec 1854 Abolished by French colonial authority. 13 May 1871 - 12 Dec 1871 Rebellion against French colonial authority.